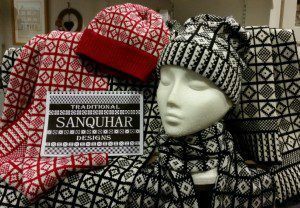 Sanquhar Pattern hats and scarves in A’ the Airts crafts shop. A 17th century pattern is set to cast-off an economic revival of an Upper Nithsdale Town, thanks to a major award. 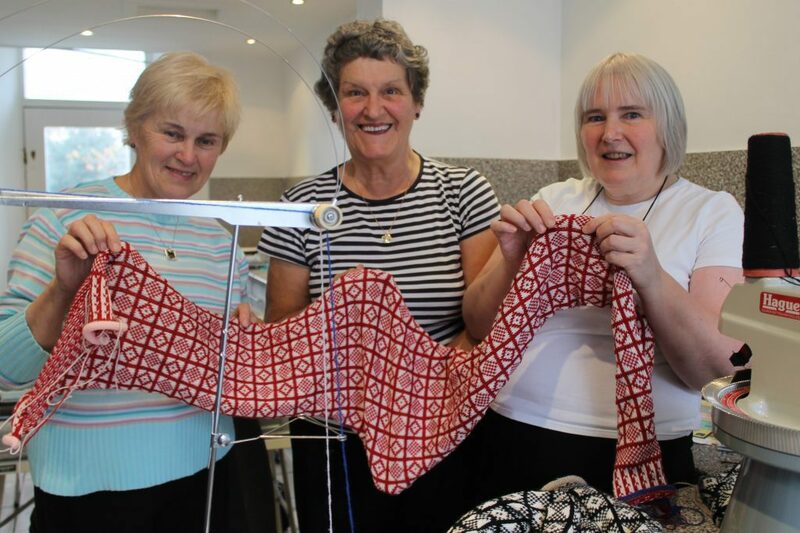 A £10,000 cash injection by Santander Bank to A’ The Airts Community Arts Centre in Sanquhar will help revive the famous Sanquhar knitting pattern and is the first steps towards an ambitious initiative which will hopefully bring jobs, tourism cash and other long-term benefits to the area as well as breathe new life into the region’s rich cultural heritage. With the money, the centre has launched a major new knitting project. It hopes to make a significant impact on the economic climate of Upper Nithsdale by initiating and supporting a long-term project to produce high-quality knitwear using the traditional, distinctive Sanquhar patterns: two-colour geometric designs that date back to the 1600s. The organisation behind the arts centre, the Upper Nithsdale Arts and Crafts Community Initiative (UNACCI) won the award in the bank’s Social Enterprise Development Awards. These are given to social enterprises and trading charities to grow their businesses to improve the local community both economically and socially. Anne Foley, UNACCI executive manager, said: “We feel proud to have been selected for a SEDA award. 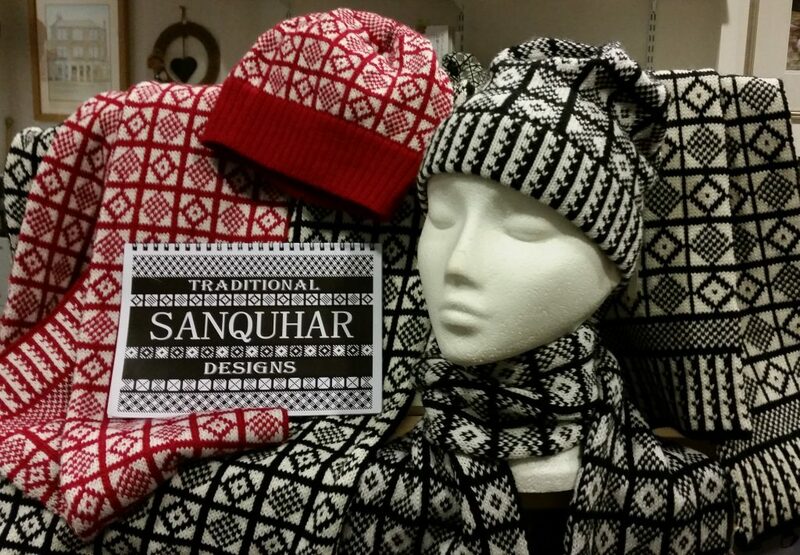 Until now, the few existing people in the town who produce items in the Sanquhar pattern have not been able to meet the huge demand for the knitwear. The project has initially been set up in a small studio in a building next door to the arts centre which was purchased in 2014 with a grant from the Scottish Land Fund. It opened its door to the public on November 1, the same day that the arts centre hosted Glasgow University’s Knitting in the Round: Sanquhar Knitting Workshop, a major event organised by the university’s Department of History. Five enthusiastic knitters – Elma Clark, Kate Sloan, Sheila Crompton, Jean Ramsay and Ruth Hanson – have already been recruited onto the project and are starting to create a range of Sanquhar pattern hats, scarves and other items that are being sold in the arts centre shop. 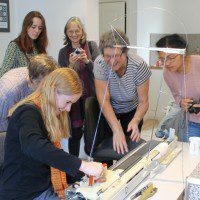 Some young people at The Glasgow University “Knitting in the Round” workshop try out machine knitting. 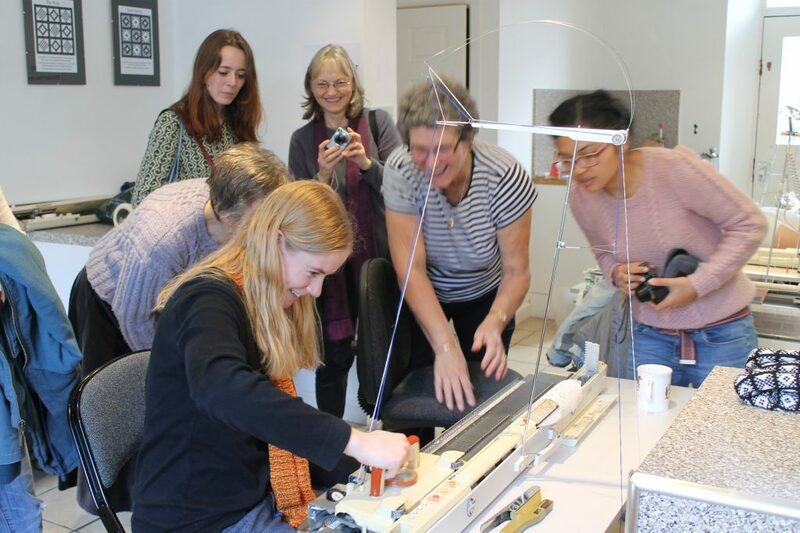 Elma Clark demonstrates one of the new knitting machines and electronic design software. The initiative ultimately aims to resurrect a dying cottage industry which will provide income for the arts centre and for the knitters of Sanquhar. 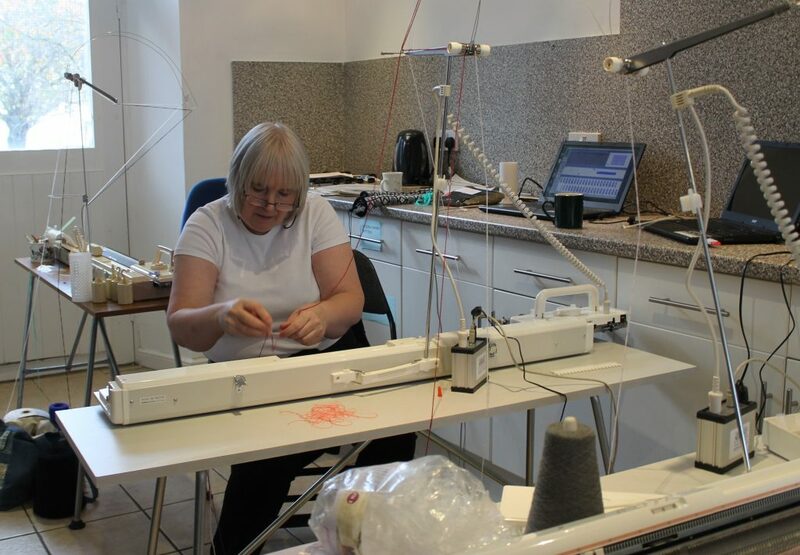 “It is encouraging to see the world-wide interest in the Sanquhar pattern,” Anne said, “and once the production of knitwear increases, we hope to introduce on-line sales, opening up an already-established global market. “We have had many customers from across the UK, Germany, Australia, the USA and Japan, and a recently published Japanese book on traditional Scottish knitting devoted over 60 pages of text and photographs to the town of Sanquhar and its historic gloves and knitwear. The flexibility of the new design software means we can also handle special orders and personalised garments. Through additional support from Santander, the project intends to offer an internship in the near future for a recent graduate in knitwear design, who will work alongside the local knitters to enhance and modernise the range of Sanquhar pattern designs. A Sanquhar Brand will also be developed for genuine articles knitted in and around the town, which should guarantee quality control and protect the local provenance of the pattern.